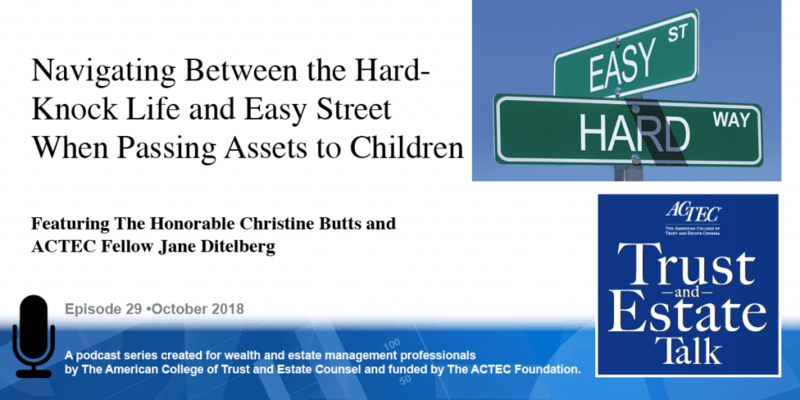 “Navigating Between the Hard-Knock Life and Easy Street When Passing Assets to Children.” That’s the subject of today’s ACTEC Trust and Estate Talk. This is Katherine Ramsey, ACTEC Fellow from Richmond, Virginia. Your children can be your pride and joy; they can also be your heirs, legatees, and beneficiaries – even as minors. Does your client intend to leave Little Orphan Annie or the next Richie Rich? To learn more about the rights of children to receive property from intestate estates and how to pass property effectively to children, we will be hearing today from the Honorable Christine Butts of Houston, Texas and ACTEC Fellow Jane Ditelberg of Chicago, Illinois. Welcome, Jane and Christine. Let’s begin with you, Jane. Well, thank you for having us today. It’s been a very interesting process working with Christine to learn more about how the process of passing assets to children through intestacy differs widely in different jurisdictions. I practice in Illinois, and I know a little about law in a couple of different states, but Christine, from her perspective on the bench in Texas, brings a whole different thought process, and it might be interesting for us to hear how those processes and the rights of individual minor children to inherit from their parents are different when you’re looking at different states. Christine, do you want to tell us a little bit about what happens in Texas? Sure. When I was researching and preparing to write the paper for ACTEC, one of most interesting differences that I uncovered between Texas and Illinois was involved equitable adoption, and in Texas we’ve had courts recognize the concept of equitable adoptions since 1951, and back then, the courts really were nervous about allowing children to pursue claims as a child in intestate estates, under a theory of equitable adoption. And so the courts only allowed those claims to go forward when there was a showing that there was either a failed adoption or failed agreement to adopt. And Texas courts in recent decades have liberalized the application of the equitable adoption doctrine and enabled children who simply relied on promises or statements from their parent that they would either be formally adopted or at some point or that they were formally adopted. And, even most recently, some courts in Texas have allowed children to pursue claims under equitable adoption in instances where they simply believed in their status as a child, and so, that was even absent of promise or agreement on part of the parents to adopt the child. That’s really interesting. That’s a very foreign concept in Illinois where proof that someone actually was adopted, has been up until recently a very critical part of our law of intestacy. Right. Well, and in 2013, I understand that the state of Illinois formally recognized the concept of equitable adoption when they decided the case entitled Dehart versus Dehart. That was a really interesting case to me, and it had incredibly compelling facts. Do you want me to tell you a little bit about that case? I would love to hear more about the facts. I’m aware of the decision, but don’t know the details. So, the Dehart case involved a couple, Donald Dehart and Virginia Dehart, and before Virginia was married to Donald, she had a child from another relationship, and the child’s name was James. Two years after James was born, Virginia ended up marrying Donald, who was not the biological father of James, but James didn’t know this. In fact, Donald through behavior and through statements caused James to believe that he was the biological child of Donald. Donald went so far as to hire an attorney to gin up a birth certificate indicating that Donald and Virginia were both the natural parents of James, and it wasn’t until James was 56 years old and trying to obtain a United States passport that he discovered he was not the biological child of the person he believed was his father: Donald. 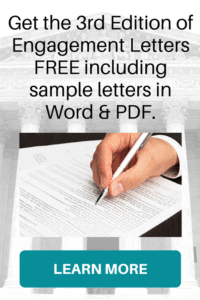 And it was those compelling facts that the Supreme Court of Illinois – apparently they were extremely persuaded by these facts – and they recognized equitable adoption as a legal theory under which a non-natural child could inherit from a parent. And it’s important to note that equitable adoption is based in contract theory. And because it’s based in contract theory and because it’s an equitable remedy, it’s important to realize that the child can only inherit from the parent, not through the parent. That’s interesting, because when we look at adoption in terms of legal adoption, that typically makes the person an heir of the adopting parent as well as an heir of the ancestral relations or collateral relatives of the adopting parent as well, as Illinois abolished the stranger to adoption rule back in the 1950s. So this is really in the equitable adoption area applying the same stranger to the adoption rule, meaning that only the adoptive parent is treated as related to the adopted child for intestacy purposes, unlike it would be in a legal adoption today. That’s a really fascinating difference. Do Illinois and Texas both follow the same rules for how a particular individual child’s share of the estate is computed? 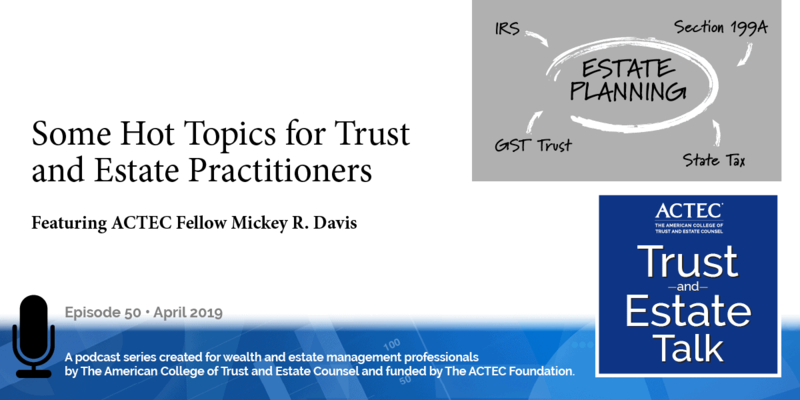 Because I know that there are multiple different ways of dividing assets among children and grandchildren, particularly if there are some descendants who predecease the testator. I know that the Uniform Probate Code, for example, doesn’t use the same method of computing the shares as the state of Illinois would do. What is Texas’s rule? So, in the United States, there are three schemes for intestate distribution, and with respect to all three of the schemes, children take equally. And each of the three schemes is distinguished in the way that they handle shares for grandchildren. The three plans for intestate distribution are: 1) Per capita, by generation 2) Per capita, with representation, and 3) Strict per stirpes. And I believe that Illinois subscribes to these strict per stirpes approach which would enable the children of a predeceased child to take only the share of the child would have received had they survived the parent. That’s right. In Illinois, if there are three children, and one of them has died prior to the testator, even if that child had five children, they still only take the one-third share that the parent would have. And if two children were deceased and they had unequal numbers of their own children – so their grandchildren – they would get unequal shares. Right. And so, Texas is a lot like that; in fact the only difference is, it’s a little bit more complicated. In Texas, let’s say you had a Mike Brady, and Mike Brady has 3 sons – Greg, Peter, and Bobby – okay? And Greg and Peter both predecease Mike, and they each leave children, but they don’t leave the same number of children. In that case Greg’s children receive his one-third – just like in Illinois – and Peter’s children receive his one-third, and Bobby has his one-third. The one exception or the one difference Texas makes in contrast to Illinois is in the event all the children predecease the parent; then the grandchildren essentially step into the shoes of their parent and take equally. And so that’s why it’s called per capita with representation because we still have representation but in the event that all of the descendants of one level predecease a testator, then the next level of descendants, they are treated equally. That’s really interesting. 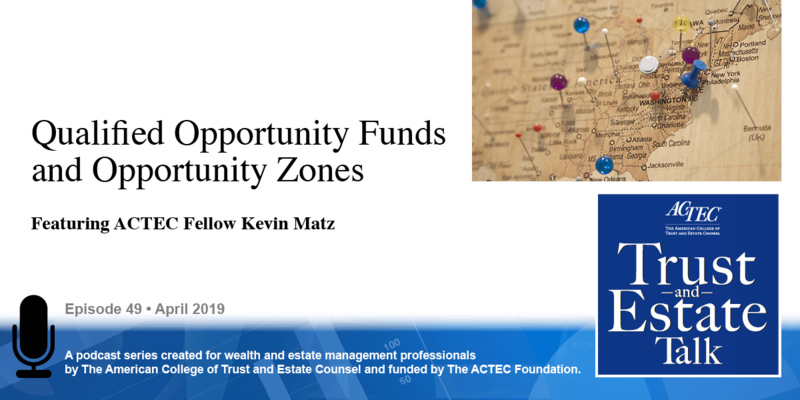 I know under the Uniform Probate Code Representation Rules we actually get a more extreme result where the shares that would have passed to – in your example – Greg’s and Peter’s children are added back up again and re-divided per capita at that lower generation. It’s a very interesting concept. I haven’t really worked in many states where that’s actually the rule, but I can see the appeal. 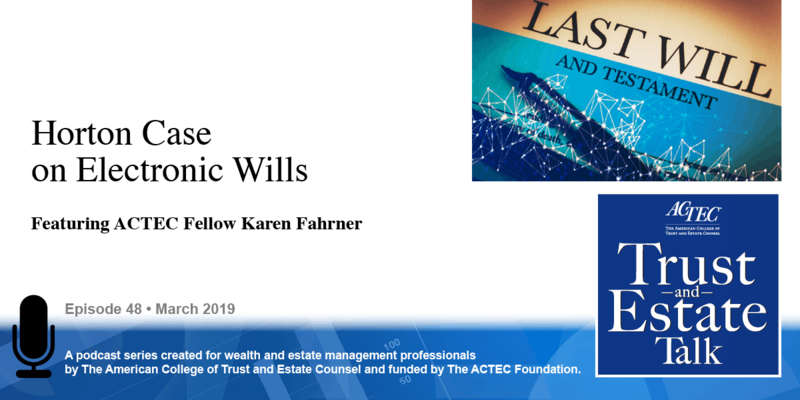 It makes a lot of sense because the Uniform Probate Code explains that the reason it’s like that is there was some sort of a study done by some ACTEC members, and they reported that would be the most favorable result according to what they believed their client would want. Right. They interviewed a lot of clients and surveyed them to see if that’s what they would want. So these are just a few tips on the topic of passing assets to children. It’s been a pleasure to be with you today. Thanks for having us. Well, thank you both for being here and helping us understand more about the inheritance rights of children.